As social insects ants are found in colonies (large collections). Dealing with ants involves treating not only the location you are seeing ants but finding and exterminating the colony location. Ants are typically attracted to open water or food sources. These foods include sugar or protein based food. Once the food is located ants will form the typical trail commonly seen. This is done by releasing pheromones allowing other ants to follow. As we commonly see, killing just the ants you see in the area often does not stop the trail of ants permanently. 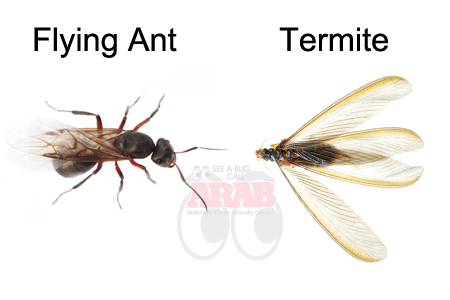 A common mistake we see if misidentifying flying ants and termites. Although both are similar in size and basic look there are some striking differences. Note the flying ant has a hook on the antenna. It also has a much smaller defined pair of wings. The termite has a wide body along with its most defining characteristic the long slender wings. When seeing winged termites you’ll immediately note they appear to be walking wings they are quite large. Often treating for ants involves both inside and outside treatments. We will evaluate your ant problem and provide both treatment for the current infestation along with preventing further intrusions.